This chapter analyzes the impact of microfinance on poverty, in general, and female-headed households, in particular, for Ghana. The analysis shows that there are three types of microfinance institutions in Ghana, and successive governments have identified and upheld microfinance as the means to reduce national poverty rates and close the gender gap in the country. 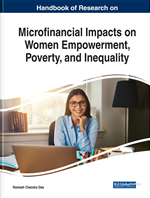 The analysis also demonstrates that microfinance has both positive and negative impacts on poverty and female-headed households. Microfinance has contributed to narrowing the poverty gap between the female and male gender, and improving the quality of their lives. However, on its own, it is not sufficient and necessary means to poverty reduction, growth, and development. The extent to which microfinance impacts on poverty is not conclusive. This necessitates remedial measures such as regulation and monitoring, proper balance between needs of clients and commercial interest of institutions, incentives to microfinance institutions, and capacitation of the poor and institutions. Two concepts of poverty and microfinance have to be clarified before delving into the impact of microfinance on poverty reduction. Poverty is universally defined as an economic and non-economic condition. Thus, poverty is a situation suffered by people who do not have money to buy the basic necessities of life in the marketplace and non-material needs through their own efforts. Therefore, it is both income poverty that results in lack of food, clean water, education, health and sanitation; and human poverty in terms of lack of human dignity, agency, opportunity and choices. The chapter relies on the conception of microfinance as small and short-term loans to poor entrepreneurs who are excluded from accessing start-up capital from formal financial institutions (Rudd, 2011, p. 1). This is complemented by a broadened definition of microfinance as the provision of financial services such as loans, savings, insurance, and transfer services to low income clients or the poor (Asiama & Osei, 2007, p. 3). Literature has for a long time indicated that microfinance is critical to financially capacitating the poor in general and women in particular to start and expand micro businesses to generate income and stimulate growth and development in local communities (Rudd, 2011). This became more pronounced with the success of the Grameen Bank that provides female clients with small loans for business investment as a means to empower them. Bateman (2011, p. 1) acknowledges that for three decades, microfinance has been the major tool for poverty reduction and bottom-up local economic and social development. The United Nations (UN) (2013) emphasizes the importance of microfinance in offering women economic opportunities and resources as a means to alleviate poverty, and empowerment so that they are able to deal with their vulnerabilities. The UN (2013) labelled 2005 as the International Year of Microcredit, in recognition of its ability to lift families out of poverty and achieve six of the eight millennium development goals (MDGs). Thus, it forms the core means for successful realization of the MDGs. In this respect, microfinance became a global strategy for poverty reduction, transforming and improving the quality of life of the poor and vulnerable groups, and empowering women. Indeed, classical theory posits that microfinance (loans) is expected to earn high returns, improve welfare and living conditions to break the stranglehold of poverty and reduce inequalities, unemployment and deprivation. The expectation is that the poor would achieve financial self-sustainability (Bateman, 2011; Rudd, 2011).